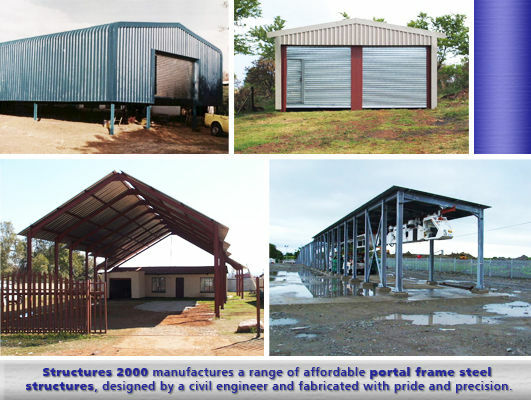 Structures 2000 manufactures a range of affordable portal frame steel structures, designed by a civil engineer and fabricated with pride and precision. In addition to the standard range we can custom-manufacture structures according to requirements. We erect our structures throughout South Africa, and we export to African countries and Indian Ocean Islands. Structures 2000 manufactures a range of affordable portal frame steel structures, designed by a civil engineer and fabricated with pride and precision. Structures 2000 manufacture steel structures for churches, warehouses, factories, hangers, shopping centers, offices, carports, food processing factories, meat packaging plants, workshops, boat lockers, farm sheds and carports. Enclosed steel structure with bullnose and roller shutter door – Chromadek. Custom made steel structure with wider doorways and crane rails.